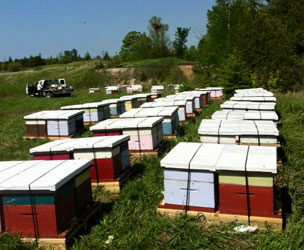 Lazy J Ranch offers both large and small scale pollination serivces to farmers and agricultural businesses across Canada. We have extensive knowledge and experience managing crop pollination and can help increase the chances of a successful yield of produce or seed. Get in touch with us to discuss your pollination needs. Lazy J Ranch also stocks bee keeping supplies for both commercial and hobby bee keepers. Contact us today for our bee keeping supply product list. Bees help set as many of the early vigorous blossoms as possible. Larger and more uniform fruit and increased pounds per acre are associated with an increased number of bee visits. A Higher Concentration of Bees In Your Orchard can Make you Money. A few Lazy J Ranch hives after being transported to a local farmer's field.